Welcome to our best steam vapor cleaning tips when it comes to cleaning furniture and everything else. Vapor steam cleaning is a breeze once you follow these guidelines. When cleaning furniture there are many issues you may have to face at one point or the other. These include removing pet, urine, ink and marker stains. We will also cover other general cleaning “Dont do this!” I am sure you will want to avoid. When faced with urine or vomit on your furniture, don’t despair. Approach it step by step and you will soon see positive results. The first step in dealing with this is quickly blotting and removing the excess moisture from the area as quickly as possible. Use a clean cloth to continuously blot and remove as much as possible. The next step is to use an oxidizing agent, for example, OUT! Orange Oxy Stain and Odor Remover and spray it onto the stain. Let this sit for about 10 minutes. This product will seep deep into the fibers of your furniture to remove the stain and neutralize odor causing bacteria. Use another cloth to blot the area and remove as much moisture from the area caused by the oxidizing agent without rubbing as we don’t want to spread the stain around. The final step is to steam clean the entire piece of furniture paying special attention to the stained area. If after you have done this and the smell still persists, you can use baking soda which is a great odor neutralizer. 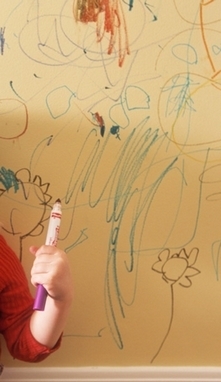 Ink and Permanent marker stains are very common, especially with kids in the home! But, not to worry, these can be eliminated with a little help from our steam vapor cleaner or even with a regular steam cleaner. Note that the best time to remove permanent marker stains is when they are fresh because the older this stain is the more difficult it becomes to get rid of. The first step includes blotting the area with alcohol or a hair spray which is non-oily. I have a friend with ‘creative’ children who swears by using toothpaste to wipe the stains away. After you do this, use a vapor steam cleaner to apply steam on the area and a cloth to remove the stain which the steam lifts off of the wall. A few things to note when steam cleaning furniture: make sure that you first test the steamer on a small part of your furniture to make sure that it does not damage the upholstery or causes shrinkage. Also, if you regularly steam clean your sofa, you may want to occasionally use an anti foaming solution. Use this to prevent any extra solution that has dried in the furniture from re-sudsing. Once you have finished steam cleaning, you should have some fans set up to facilitate fast drying of the said furniture to prevent it from forming mildew and to make sure they dry quickly and thoroughly. Steam vapor cleaning is certainly an effective and environmentally friendly way of cleaning. It is certainly able to perform as well as and in many cases better than its chemical based counterparts. Even though steam cleaning is great for just about everything, there are a few materials it should be kept away from. These include very heat sensitive materials like silk and velour should not be cleaned using steam. You should also take care not to use powerful steam cleaners on the exterior of your vehicles as it can damage the paint job but is completely safe for cleaning the interior and wheels of the vehicle.